When Sawsan Morrar arrived for the start of UC Center’s 2015 summer journalism program, she was an accomplished freelance writer nearly a decade removed from her academic career. But Sawsan wanted more than the uncertainties inherent in freelance work. She sought a bona fide career in journalism, and that goal meant a return to academia. UCCS was the first step – and the gateway. 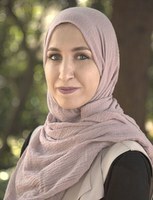 From that point forward, Sawsan’s steps were giant strides: admission to UC Berkeley’s Graduate School of Journalism; a 2017 White House Correspondents Association Scholar; a grant and fellowship from the Pulitzer Center for Crisis Reporting; a Washington Post assignment that led to cover stories on the Stephon Clark shooting and aftermath in her native Sacramento; and commencement speaker at the Graduate School’s 2018 graduation. Her Masters’ thesis highlights this diversity. A group project, the reporting focuses on inequality in Fresno across a variety of issues, from immigration and education to policing, bail reform and environmental justice. It’s put together and delivered using techniques of “new media” – writing, photography, audio and video. In 2017, a funding grant from the Pulitzer Center for Crisis Reporting allowed Sawsan to travel to Jordan to report on the lack of resources available to Syrian refugees for mental-health therapy. She presented her findings during a conference at the Bloomberg Center in Washington, D.C. It was also in the nation’s Capital that Sawsan called attention – on a national stage – to challenges that she and other Muslim women face as journalists. Awarded a White House Correspondents Association scholarship in 2017, Sawsan was recognized during the association’s annual White House Correspondents’ Dinner, an event famously boycotted by President Donald Trump. The irony was not lost on Sawsan. As she begins the next phase of her journalistic career, Sawsan says she would like to continue the kind of international reporting she has experienced in Jordan and Malaysia but that her main interest is political reporting – closer to home. Note: Sawsan Morrar recently joined to Sacramento Bee as their school accountability reporter. See article here.